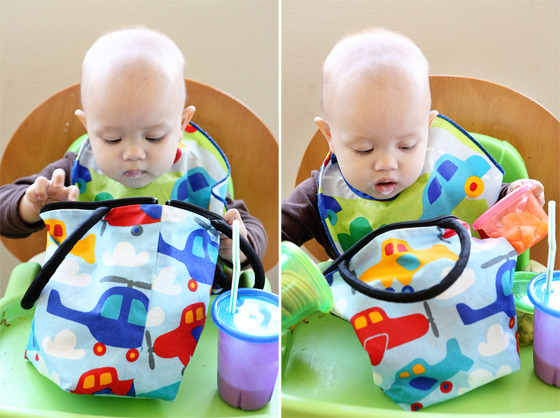 I first tried Mimi the Sardine's bibs based on my cousin's recommendation and found them to be some of the best out there! Later, Mimi the Sardine hired me to do some photography for them and I got a chance to work with more of their products. I was so impressed with their beautiful prints, durability and wonderful design! This is their lunchbug (their kid-sized lunch bag). It comes in a variety of vibrant and fun prints, is lined on the inside with a complementary dot or stripe print, has cushioned handles and a wide, zippered opening. All their fabrics are designed in Sweden, manufactured in the Bay Area, are stain-resistant and eco-friendly, can be wiped clean or machine-washed. Pictured below is the propeller print. Note that this lunchbug is from Mimi's older line. It is lined with the same fabric as is on the exterior of the bag. This is what will fit in a lunchbug: Avery’s afternoon nosh of Straus Organic Plain Whole Milk Yogurt, Whole Foods Organic Golden Rounds, tangerines, Annie’s Chocolate Chip Bunny Grahams and a Blue Ice pack to keep Avery's yogurt cold in case we're out for a few hours. Avery always gets excited with anticipation when she sees her lunchbug because she knows that her meal is in there!